I’ll be seeing my target for another date on next Friday (hopefully neither of our babysitters cancel on us) so I was wondering if I could use some powders on him.. I don’t want to carry the packs themselves Incase he catches me with them so I was thinking.. Can’t I just put them in a compact with like eyeshadow or blush powder (take out whichever comes in the compact originally & that I won’t use anyways) it would be kiss me now & love me powders since the only others that I have are return to me and reconciliation which I don’t currentl need.. But I was wondering what others thoughts on here were about doing that? I could keep a blush brush or eyeshadow brush with it that way I could lightly brush it on items in his truck or even his house if we go there again & if he sees me then I can just play it off like it’s scented makeup that I’m putting on.. Thoughts? I haven’t seen anyone else mention that idea so hopefully if everyone thinks it’s a good idea it can help others in the future Thank you! Yes you can use the powders in this tricky method. Many ways to use powders and doing so unnoticed is often preferred lol. Dust things that he will come into contact with, sprinkle in his shoes telling him to come to you, on his pillow telling to think of you. You can also cary the oil with you and wipe in items lightly as well. Best of luck! 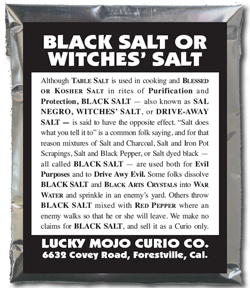 I have a question about making black salt -- I'm not certain this is the right category to ask. I'm preparing to make black salt. Many recipes suggest using ashes from a fireplace or BBQ. I was wondering if temple ash -- ash from burning insense during contemplation or meditation -- would be appropriate. I also wondered what other herbs might be appropriate. I've read of the following: pine, rue, bay leaf, peppercorn, and clove. Maybe black mustard or black sesame? The forum is to help customers in their use of Lucky Mojo products. We don't advise on making products at home. In addition, if you own cats herb and root magic book you can read more about it on pages: 173-174. On page 174 it is mentioned under two workings, 1. to hurt an enemy, 2. to move someone out. I would not use temple ash unless the ash was from work directly related to the use of the black salt. I actually found a whole section on ash on the site, and then wanted to delete my post before anyone replied to it, but was out and about. Le sigh. I have Cat's book but didn't expect it to cover ash. This site is just so rich with content it's sometimes hard to find things, and of course my desire is to know yesterday! If I were to use powders instead of Chinese Wash as a floor wash for house cleansing (because 90% of my house is carpet), would I have to dispose of the vacuum canister remains in the same way as the wet floor wash? Also, would I need to do the cleaning before dawn or could I do it the day before and then dispose of at dawn? Also, what powders would you recommend for this purpose? thank you! For carpeted areas, I like to sprinkle the powders onto the carpet then sweep them towards the front door with a broom. That way, I can collect them and dispose of them the way I would dispose of the floor wash water. You can do it the day before and dispose the following dawn. The powders you would use are dependent on your goal. 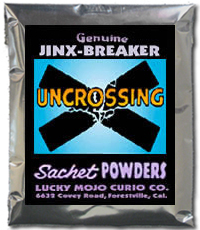 For removing any spiritual messes in your home, I would use Uncrossing. Thank you! I don't suspect any spiritual work being done on me. I'm trying to clear out the space after a breakup. Would uncrossing still be the right choice? It would still be OK, as it clears out any negative energy lingering in a space (whether sent there intentionally or just residual energy). Sometimes bad arguments include harsh words which are their own form of curses, so it's a good general practice to clean up those spiritual messes after a breakup. We use Chinese Wash as a means of doing just that, so this would be an appropriate powder replacement.